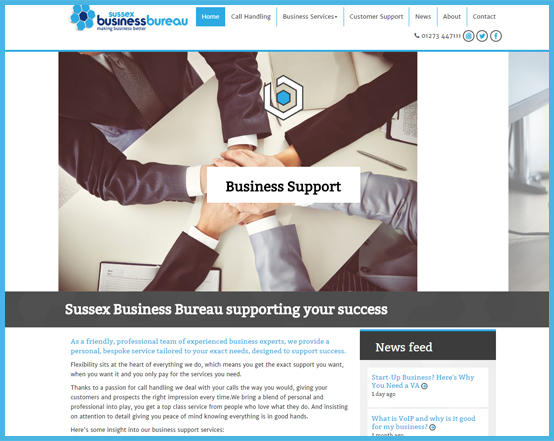 Sussex Business Bureau required a redesign of their previous website, that would be able to offer their services and enable visitors to contact them. Sussex Business Bureau provide a range of professional services for businesses of different sizes in the Brighton and Sussex area. Their mission is simple: Making Business Better. They needed a website that would be able to portray their services in a professional manner. They also needed a blog and news system, to keep their visitors up to date with the latest news in their sector, as well as provide professional business advice and tips. After an initial couple of meetings with the client, we started the development of the site. We built the website in our Timberwolf CMS, that would enable the client and their employees to be able to edit, update and add content in an easy manner. The website is fully responsive to work across different devices and browsers. We built a blog and news system. The blog is simple to add new features to and images within. The news feed on the home page allows for both blog and news items to display automatically when they have been added. 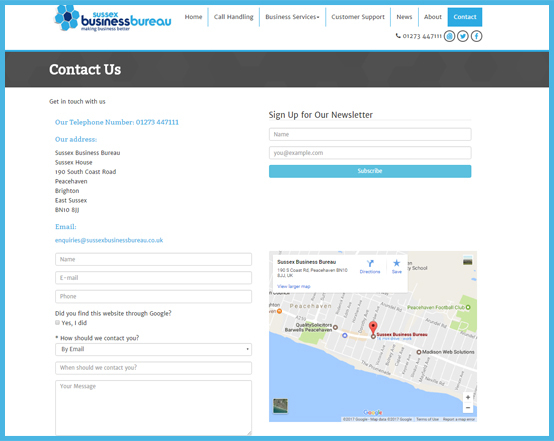 There is a carousel on the home page which changes automatically, showcasing the different services that Sussex Business Bureau have to offer to their customers.